Have you ever had the Mommy “moment” that you just want to take back or pretend that it did not happen? I have to admit that I have had more than my share of those moments. The times when my mouth moves faster than my brain. Or my actions move at warp speed while my brain drags out the consequences. 5:50pm – I am almost ready for work. Yes, I am working night shift – which causes me automatically be a little grumpy 🙂 Standing on the balcony, I see Lil Sis rolling around on her Heeleys. It is time to drag the girls inside (kicking and screaming). I glance at Lil Sis again and am about to call her in. BAM!!! Face first onto the pavement! I wait. She gets up and starts to walk towards me. Her friend questioning whether she is okay. She continues toward me, mouthing something that I can”t understand. Still no tears!! In the door and the tears start flowing. “My arm! My arm hurts really bad. Mommy, this is the worst day of my life.” Hugs, kisses, cuddling. Her guinea pig died today. She is overwhelmed with sadness. Now the hurt. Is it hurt or embarrassment from falling or drama??? A little later, the Man. I think I am going to take her to the ER. Do you have the insurance card? Tell the doctor this? Tell the doctor? Call me when you get there? Honey, we will be fine. Don”t worry. She is okay. Breathe. I get a play-by-play from the ER via text messages. They are at the local children”s hospital. I am at another local hospital. My heart is with them. 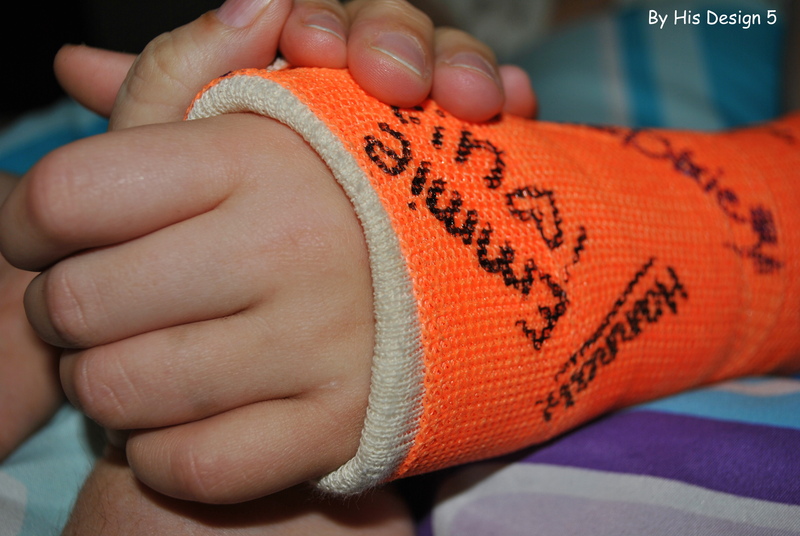 Small fractures of both the ulna and the radius. MOMMY GUILT! 1:30am – The Man says She wants to stop by and see you. Hugs. A smile. I love you, Mommy! As a child, we forgive so easily. As adults, we hold on to the anger. We wonder if we can forgive one more time. Yet, we know we should. Just as we are forgiven – we have to forgive!! 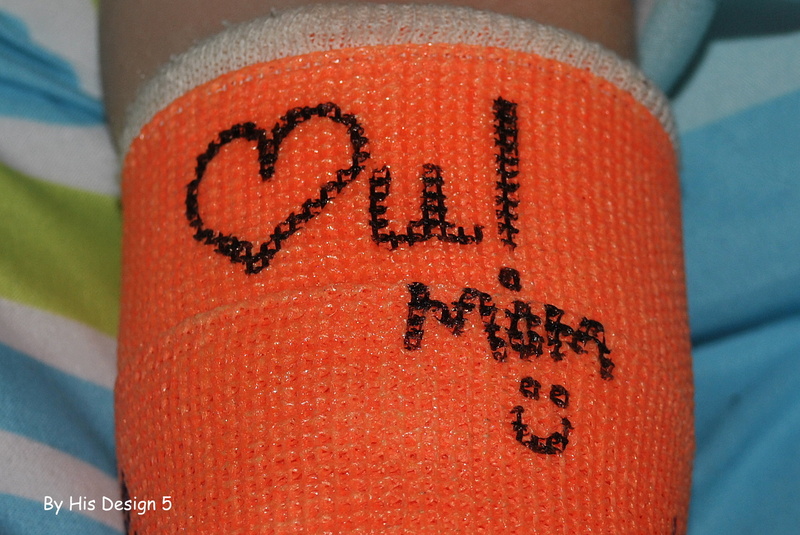 She asks me to sign her cast. I do!! Do you have a “mommy guilt” story? I would love for you to share it with us. This entry was posted in daughters, Families and tagged forgiveness, mommy guilt. Bookmark the permalink. Your girls are tough as nails! 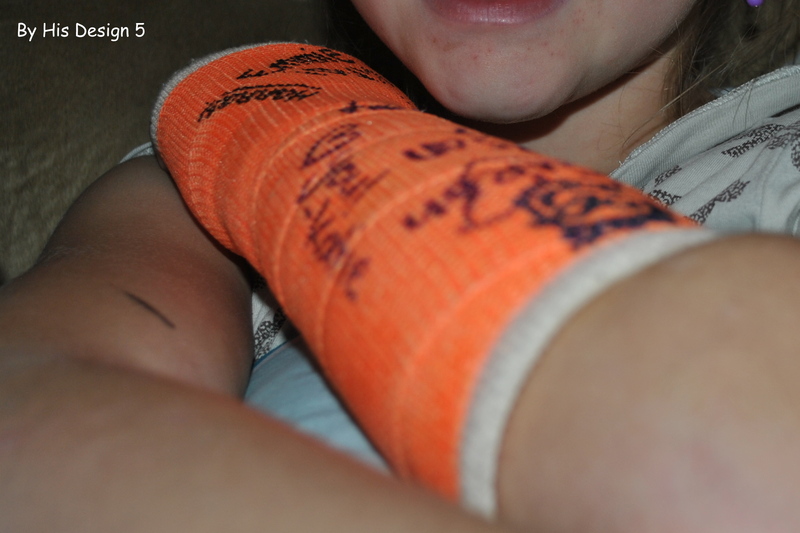 Middle sis didn’t cry either when she broke her arm. I wish I could be like them. 🙂 I miss y’all! I am sure that we have all experienced “mommy guilt.” I know I have. Thanks for being so transparent and sharing your story. Something similar happened when my sister was little. It was hours before my mom finally took her to the hospital, because everything just seemed fine. It wasn’t until she couldn’t sleep for the pain, that my parents took her in. *hugs* Don’t feel guilty. Beautiful post Amy!!! I do not have an article written, but yes, we all fall under the trap of mommy guilt…however, we must remember ‘where’ this gu”ilt comes from’ and ‘whom’ it does not come from! Romans 8:1 is a verse we need to live by! Like you said, “so grateful for his grace and forgiveness! I didn’t say it was easy, but it is what God desires and when we keep our eyes focused on Him and His truth, the lies that we want to believe, will fade away. Stay focused on the finished work of the cross! You are an amazing mom!!! I really needed to read this today. Thank you for the encouragement and for being so transparent! So thankful for FORGIVENESS!!! !